2 week after receiving all the content from you. All web pages will have a common highly optimized and fast-loading design structure for best search engine performance. Pre-designed Premium Template- Pre-designed templates expedite the process of setting up a new website. In the business world, time is money; hence, using templates can save money. Our premium templates have a highly optimized and fast-loading design structure for best search engine performance and can be easily customized to reflect your company's branding. Your choice of domain name - subject to availability. Contact page contain dynamic Google Map of your business location. Google Analytics is a enterprise-class web analytics solution that gives you a rich insights into your website traffic and marketing effectiveness. Powerful, flexible and easy-to-use features let you see and analyze your traffic data in an entirely new way. Basic SEO, including placement of required meta tags and keywords. Facebook fan page will be set up with default layout and selected content from your website. Facebook Fan Pages attracts Facebook users to "like" your company profile – once they become a follower, they effectively become part of your list when you have announcements to make. 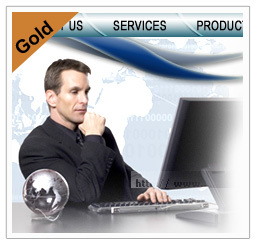 Gold Corporate Web Hosting Plan. Billed monthly, website hosting fee covers the cost of hosting your website on our secure, reliable servers; using our powerful, award-winning, software platform. It also contributes to the costs of providing you with robust, personalized Content Management System that can be accessed from anywhere. Comprehensive website stats to track visitors coming to your website. Your hosting plan comes with 7 GB disk space, which is ample enough space to establish a graphics-intensive website. Also, you can always buy additional disk space as your site grows. Whenever a visitor comes to your site, data is sent from our web servers to your visitor's computer. This data can be composed of web pages, images, movies, sound files, programs, compressed files, or anything else on your site that can be viewed or downloaded by visitors. All these requested data added together equals your total data transfer. The more visitors you have, or the larger the files on your web site, the higher data transfer limit you'll need. Your website comes with 70GB of bandwidth per month. You can always buy additional data transfer as your site grows. Contact page contains a form that emails you inquiries coming from your website. Website visitors can search and find what they want without browsing through all the pages. This will simply add a quality factor for the web site. All the pages include a Breadcrumb on top for easy access to each one of the parent pages. Access your email via web or using major mail clients such as Outlook. Visitors of the site can register providing their name and Email address so that they can access resources that are available only for members and receive newsletters from you. Also they can update their address book and account information. A powerful and multi-threaded discussion forum. Features include unlimited forums and categories, topic watching, email notification, Private Messages, user ranking, advanced permission schema, moderation options and poll. Create image gallery from folders of images. Creation of thumb images is automatic. Shows catalogue of selected videos. Video list or play lists can be edited via CMS. Supports popular video hosting: Youtube, Vimeo, Yahoo Video, Break.com, own3d.tv, and College Humor. Include social network buttons or box counters from Facebook, Google Buzz, Twitter, StumbleUpon, Digg, MySpace, LinkedIn, MisterWong, Multiply, HelloTxt, BitLy, Google Translate, Amazon, Baidu, Bebo, BlinkList, Blip, Blogger, Faves, FormSpring, Google Reader, HackerNews, Hotmail, Instapaper, My AOL and Netvibes in your content article. Visitors can select from over 50 available languages and the translation happens on the fly. Would you like to advertise special sales to selected customers? Or, send newsletters to registered customers who opt-in? Keep your visitors up to date with your latest site changes or product news! Send mass HTML email messages and manage your list subscribers in our easy to use Mass Email Tool.